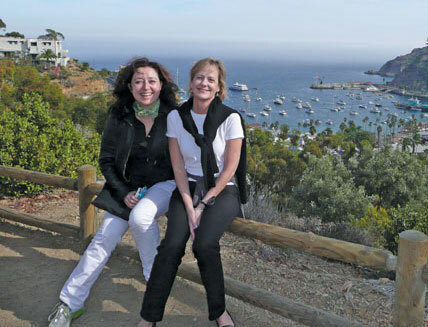 EMC Society President-elect Francesca Maradei (left) and Newsletter Editor Janet O’Neil relax during a visit to Catalina Island. Board membership facilitates the outreach experience. Have you thought of running for the EMC Society Board of Directors? If so, now’s the time – see the nomination petition on page 84 of this Newsletter. It’s a simple word, but it has big meaning for the EMC Society. In this issue of the Newsletter, you will see a common thread about the tremendous outreach activities undertaken by the EMC Society Board of Directors, by our Chapters in recruiting new members, and in simple stories about how our members are outreaching between each other. In his President’s Message on page 4 of this issue, Elya Joffe reviews some of the outreach missions accomplished in 2008 by members of the EMC Society Board of Directors. All IEEE Regions were visited by various Board members in an effort to increase the number of new Chapters in the EMC Society. Technical presentations were given to build excitement and enthusiasm for EMC. Social time was spent networking to get to know potential members better in these new areas in order to learn how membership in the EMC Society would be mutually beneficial. In addition, friendships were made so future communication is facilitated – now a face can be placed with a name! On the Chapter activity, you’ll find exactly the same number of contributions from US based Chapters as from non-US based Chapters. Starting on page 12, you can read about Chapter activity from Beijing to Seattle. You can also read about the newest Chapter in Harbin, China. Welcome to the Harbin EMC Chapter! And, you can read about the Germany EMC Chapter’s involvement in two major conferences last year: EuroEM 2008 and EMC Europe 2008. On pages 73-80 you’ll find a review of the host venues, keynote speakers, papers presented, and, of course, the social events that surely sparked engineers thinking about future paper topics. This is a tremendous example of the results of outreach – more regional Chapters and more regional conferences. Finally, I conclude my column with two simple stories about our members outreaching to each other. In one, Don Heirman, a long time EMC Society member, shares with us his thanks for the support he received upon the passing of his wife of 45 years, Lois Heirman. I had the privilege to personally know Lois and always appreciated seeing her at the many EMC events she would travel to with Don over the years. I could always count on her warm smile and funny giggle. Lois will be truly missed by all who knew her. In our second story, it’s amazing how one little comment, which may seem so inconsequential at the time, can brighten a person’s life. In this story, Dan Hoolihan shares how he met a student in Germany who casually mentioned a paper he was referencing in his Ph.D. thesis. I happened upon the trio involved in this story at the EMC Symposium in Detroit last year and caught the delight in their eyes for having “found” one another. Do you have an outreach story to share? If your story is Chapter related, please contact Todd Robinson at todd.robinson@ckc.com. Todd eagerly looks forward to submittals on Chapter activity from near and far. If you haven’t submitted material for Chapter Chatter and you have a Chapter story to share, please contribute to our outreach efforts by publishing in the Newsletter. For all other stories, please send your material to me at j.n.oneil@ieee.org.